Active discussions began in Armenia after the announcement of state budget for 2018 last December. The main topic of discussions was the fact that the budget is going to be increased by 8%, the government talked about recovery from external shocks, such as economic problems in Russia and fall of metal prices, etc. The pensions however, have not been raised. According to Armenian media outlets, expenditures of the budget will increase from 1.36 trillion Armenian drams to 1.46 trillion (slightly more than $3 billion). Pensions (both base level and work experience premiums), however, have been left unchanged for the third year in a row. An average pensioner will get 39,400 Armenian drams (about $82). Minimum salary (55,000 Armenian drams or $114) won’t increase in 2018 as well. It wouldn’t seem to be too much of a problem, but the minimal basket of goods for the first half of 2017 is 51,200 Armenian drams ($106), what means an average pensioner gets only 75% of the mentioned minimum. A social network user has already made a sardonic remark on the topic: “an average pension covers only 75% of subsistence minimum, that’s why pensioners must eat 25% less”. That may be too true to be funny. “In 2017, an average pensioner in Armenia was receiving 40,500 drams, in 2018 the number will be down to 39,400, i.e. 1,100 less. That is a cost of 4—5 kilograms of potato or 400—500 grams of cheese, or three kilograms of sugar,” an Armenian news agency commented the news about the average pension getting lower, because average work experience in 2018 will shrink. The government made quite a peculiar comment on the matter: “It is hard to increase pensions in Armenia in 2018. Even 1,000-drams increase will cost budget 5 billion drams (more than $10 million). In that, our desires and possibilities miss one another,” Minister of Labor and Social Issues of Armenia Artyom Asatryan said. Nothing can be done if financial troubles, budget deficit and external debt ($5.8 billion, i.e. 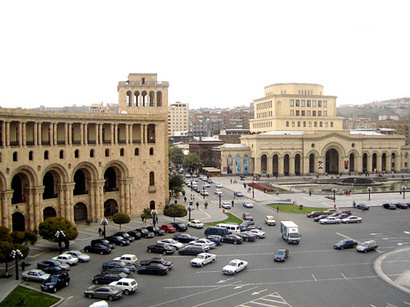 $2,000 per capita) don’t allow the Armenian government to care about their own people. In this article however, I will not cover the reasons for Armenian authorities' failure to correct the lamentable economic situation the country is in. In 2018, military expenditures are to be increased from 205 to nearly 234 billion Armenian drams, what makes 16% of the republic budget. It looks like while Armenian government has no money for increase of pensions and salaries, it does find enough resources for militarization. Does that match the non-stop statements about urge towards peace and giving up on militant rhetoric in the 30-year long Karabakh conflict? Not really. But that perfectly fits into other news circulating in Armenian media, about secret purchases of Defense Ministry being made with “kickbacks” through a company of Chief of Armed Forces General Staff Movses Hakobyan. Indeed, the increase of military expenditures looks like a prudent direction given that the money will accumulate in certain pockets anyway. A question arises: what the money is being spent on if there are no developments in socio-economic sphere? Why the budget is always short of funds? Let’s not forget that a lion’s share of money resources in Armenia comes from Armenian diaspora from all over the world and through many loans routinely granted by international organizations to support development of certain spheres of economy. An answer to these questions is quite simple: the military is not an only sphere where the resources are being guzzled away. Money of the taxpayers accommodates in certain pockets and then gets taken out of the country. Why’d authorities want to keep money in a country they are deliberately vandalizing? It is much safer to keep it abroad, away from the people’s attention. “During the last two decades billions of dollars, nearly a million a year, were taken out of the country, that has a poverty level of above 30% and is in a state of unfinished war. The government collects 1,000 drams from everyone, whereas in contrast some individuals collect their money and take it out of Armenia,” an article of analyst Aram Amatuni reads. Authorities report about widescale anti-corruption campaign, protection of human rights, and transparency of state-management, wave the EU Association Agreement flag as a confirmation of sincerity of their intentions. Nevertheless resources leave the country bypassing the people who are mass-migrating abroad sick and tired of subpar living standards. “How it comes that there is still no sign of evident decrease and limitation of corruption, how it comes that both people and capital are constantly flowing away from the country, how it comes that the state budget is out of money and inflation is used to fill it up?” the Armenian analyst asks. Resources dry out quickly. Money vanish without a trace. And as for people - those who can, migrate to different directions. And I’d swear blind that status-quo in the protracted Armenia-Azerbaijan Nagorno-Karabakh conflict will continue to be used as a tool in hands of the Armenian ruling elite to spread fear among the country's people, whose children are paying with their lives for the ambitions of their leaders day after day.